Peter Hillesheim-1 was born in 1685 in Schˆnecken, Rheinland-Pfalz, Germany. Carl Hillesheim, B: 1707 in Schˆnecken, Rheinland-Pfalz, Germany. Carl Hillesheim-2(Peter-1) was born in 1707 in Schˆnecken, Rheinland-Pfalz, Germany. He married Anna Catherine Hoos.She was born on 09 Sep 1710 in Durlach, Germany. Peter Hillesheim, B: 05 Dec 1739 in Schˆnecken, Rheinland-Pfalz, Germany. Peter Hillesheim-3(Carl-2, Peter-1) was born on 05 Dec 1739 in Schˆnecken, Rheinland-Pfalz, Germany. He married Ann Reichert.She was born on 02 Apr 1730 in Schˆnecken, Rheinland-Pfalz, Germany. She died on 07 Feb 1779 in Schˆnecken, Rheinland-Pfalz, Germany. Joannes Carl Hillesheim, B: 24 Apr 1769 in Schonecken, D: 30 Oct 1828 in Manderfeld, Germany. Joannes Carl Hillesheim-4(Peter-3, Carl-2, Peter-1) was born on 24 Apr 1769 in Schonecken. He died on 30 Oct 1828 in Manderfeld, Germany. He married Catherine Anna Turten.She was born in 1772. She died on 11 Sep 1842 in Manderfeld, Germany. Mathias Hillesheim, B: 12 Apr 1811 in Manderfeld, Germany, D: 15 Jan 1892 in Sigel, Minnesota. Anna Clara Hillesheim, B: 14 Aug 1807 in Manderfeld, Germany, D: 01 May 1810 in Manderfeld, Germany. Peter Hillesheim, B: 1802 in Manderfeld, Germany, D: 19 Mar 1805 in Manderfeld, Germany. Heinrich Hillesheim, B: 22 Nov 1813 in Manderfeld, Germany, D: 23 Mar 1873 in Manderfeld, Germany. Gertrud Hillesheim, B: 1817 in Manderfeld, Germany, D: 23 May 1817 in Manderfeld, Germany. Anna Maria Hillesheim, B: 02 Mar 1807 in Manderfeld, Germany, D: 20 Apr 1809 in Manderfeld, Germany. Unbekannt Hillesheim, B: 29 Dec 1818 in Manderfeld, Germany, D: 29 Dec 1818 in Manderfeld, Germany. Peter Hillesheim, B: 1808 in Manderfeld, Germany, D: 17 Mar 1812 in Manderfeld, Germany. Arnold Hillesheim, B: 01 Nov 1803 in Eifel, Prussia, Germany, D: 16 Sep 1880 in Sleepy Eye, Minnesota. Arnold Hillesheim-5(Joannes Carl-4, Peter-3, Carl-2, Peter-1) was born on 01 Nov 1803 in Eifel, Prussia, Germany. He died on 16 Sep 1880 in Sleepy Eye, Minnesota. He married Clara Thome, daughter of Peter Thome and Maria Suzanna Genten. She was born on 03 Oct 1805 in Eibertingen, Liege, Belgium. She died on 22 Mar 1879 in Sigel, Minnesota. Peter Hillesheim, B: 20 Mar 1846 in Germany, D: 27 Mar 1846 in Germany. Hubert Hillesheim, B: 10 Oct 1829 in Germany, D: 12 Jun 1903 in New Ulm, Minnesota. Gertrud Hillesheim, B: 03 Jan 1836 in Germany, D: 24 Jan 1838 in Germany. Hubert G. Hillesheim, B: 25 Dec 1849 in Manderfeld, Germany, D: 29 Sep 1929 in New Ulm, Minnesota, M: Johanna Christina Corey, 05 Feb 1873 in Brown, Minnesota. Mathias Hillesheim, B: 16 Sep 1831 in Germany, D: 10 Apr 1839 in Germany. Nicholas Hillesheim, B: 02 Mar 1844 in Germany, D: 11 Mar 1896 in St. Peter, Nicollet, Minnesota. Heinrich Bernard Hillesheim, B: 24 Oct 1833 in Germany, D: 22 May 1923 in Minnesota. Gertrude Emma Hillesheim, B: 30 Nov 1828 in Aixheim, Tuttlingen, Baden-W¸rttemberg, Germany, D: 26 Jan 1917 in New Ulm, Minnesota. Maria Josephine Hillesheim, B: 04 Apr 1847 in Germany, D: 22 Nov 1927 in Springfield, Minnesota. Joseph Hillesheim, B: 09 Dec 1837 in Germany, D: 24 Jul 1925 in Watonwan, Minnesota. Hubert G. Hillesheim-6(Arnold-5, Joannes Carl-4, Peter-3, Carl-2, Peter-1) was born on 25 Dec 1849 in Manderfeld, Germany. He died on 29 Sep 1929 in New Ulm, Minnesota. He married Johanna Christina Corey on 05 Feb 1873 in Brown, Minnesota, daughter of John Corey and Mary Barbara Arpagar. She was born on 03 Apr 1852 in Chur, Graub¸nden, Switzerland. She died on 13 Nov 1927 in Sleepy Eye, Minnesota. Brown county lost one of its most prominent and highly respected pioneer citizens when Hubert G. Hillesheim, for 71 years a resident of the territory, answered the final summons at 3:10 o'clock Sunday afternoon at the Old Folks' home at New Ulm, where he went to make his home on June 17th, 1928. Death came after an illness of nearly a year and a half and was brought about by complications attendant with old age. For the past four and a half weeks he had been confined to his bed. Mr. Hillesheim was ailing slightly when he left here in June last year and had complained more or less of ill health while he stayed at the Old Folks' Home. Coming to Brown county in the late 50's when his parents joined the westward tide of emigration, Mr. Hillesheim was among the very first white settlers in Sigel township, southeast of Sleepy Eye. The parents came west with a team of oxen and settled among the Indians, which was still years before the Sioux rebelled and went on the warpath. During the course of his earthly career he was a prominent figure in community and civic affairs and during his lifetime held many offices of trust and responsibility. Serving as town clerk in Stark township for many years he was later elected to the office of county commissioner from this district in which capacity her served for a number of years. He was also president of the Farmers Elevator Company in this city for many years and served as a director of the Farmers & Merchants State Bank here until about two years ago. Deceased was born in Prussia on Christmas Day, December 25th, 1849, and would therefore have been eighty years of ago had he lived until next December. At the age of 7 years he came to this country with his parents, Arnold and Clara (Thome) Hillesheim, who settled at Chicago, and a year later came west to spend their lifetime in Brown County. In October 1873, Mr. Hillesheim was joined in marriage at the Catholic church at New Ulm, to Miss Anna Corey, who preceded him in death in November 1927. For more than forty years Mr. and Mrs. Hillesheim continued to reside on a farm in this community and about eleven year ago they moved to Sleepy Eye for their future home. 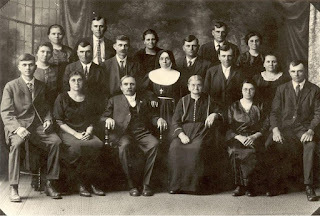 Blessed with sixteen children, eight sons and eight daughters, Mr. and Mrs. Hillesheim had the pleasure of seeing all of them grow to young manhood and womanhood, and the entire family of children still survives. Mr. Hillesheim was the last survivor of a family of five sons and two daughters. Jos A. Hillesheim, Stark township; Christ Hillesheim, Springfield; Peter Hillesheim, Sleepy Eye; Barney Hillesheim, Sigel township; John Hillesheim, Mulligan township; Florian Hillesheim, Leavenworth township; Frank and Henry Hillesheim, Stark township; Mrs. B.H. Pelzel and Mrs. Peter Gorres, Wabasso; Mrs. Oscar Juenemann, Springfield; Mrs. William Guggisberg, Gibbon; Mrs. John Juenemann, Wabasso; Mrs. Jos. A. Sellner, Mulligan township; Mrs. Fred Mikelson, Leavenworth township and Sister Huberta of Sleepy Eye. Mr. Hillesheim is also survived by a total of 77 grandchildren and 19 great grandchildren. The Solemn High Mass celebrated at St. Mary's Catholic church at 9:30 o'clock Wednesday morning was attended by scores of relatives and friends from all sections of the county, as well as relatives and friends from New Ulm, Madelia, Mankato, Srpingfield, Clemets, Wabasso, Lamberton, and other widely scattered points. The service was conducted by Rev. F.S. Rant, who was assisted by Rev. R.E. Russell and Rev. George Galles of this city and Rev. Schirmers of New Ulm. Six of the grandsons served as pallbearers, namely: Hubert and Leanard Hillesheim, Arthur and Robert Hillesheim, Hubert Sellner and Fred Gorres. Burial was made in St. Mary's Catholic cemetery. We join with scores of friends in extending sympathy to the sorrowing relatives. Bertha Amanda Hillesheim, B: 10 Jun 1880, D: 18 Dec 1952. Clara Maria Hillesheim, B: 16 Apr 1875 in Minnesota, D: 27 Dec 1954 in Minnesota. Rose Margaret Hillesheim, B: 20 Aug 1893 in Sleepy Eye, Brown, Minnesota, D: 06 Sep 1984 in Nicollet, Nicollet, Minnesota. Frank Anton Hillesheim, B: 01 May 1899 in Minnesota, D: 21 Sep 1973 in Brown County, Minnesota. Josephine Maria Hillesheim, B: 26 Sep 1886, D: 22 Jul 1979. Christina Anna Hillesheim, B: 12 Sep 1881 in Brown, Minnesota, D: 10 Apr 1938 in Brown, Minnesota. Christopher Arnold Hillesheim, B: 02 Nov 1876, D: 20 Dec 1966. Agatha Clara Hillesheim, B: 05 Feb 1895, D: 29 Dec 1993. Anna Catherine Hillesheim, B: 24 Feb 1879, D: 16 May 1975 in Minnesota. Sister Mary Huberta Hillesheim, 96, a sister of the Third Order Regular of St. Francis, Congregation of Our Lady of Lourdes, Rochester, died Friday afternoon, May 16, 1975 at Assisi Heights, Rochester. Born Febuary 24, 1879 to Hubert and Anna (Corey) Hillesheim, Catherine Hillesheim entered the postulancy of the Rochester Franciscans in January, 1899 from St. Mary's Parish, Sleepy Eye. She received the habit July 17, 1900. After completing her novitiate, she made religious profession of vows in July, 1902 and was assigned as a teacher in Portsmouth, Ohio. She was awarded her B.A. degree form the College of St. Teresa in 1925. Sister Huberta continued in the teaching profession for 63 years, serving in as Principal of St. Raphaels School in Springfield Minnesota, Winona, Sleepy Eye, Currie, Adrian, Queen of Angels School in Austin MN and other parochial schools in Minnesota, Ohio, Kentucky and Nebraska. In 1962, Sister Huberta celebrated the Diamond Jubilee (60 year) of her religious profession; she retired to Assist Heights in 1963. She is survived by four sisters and two brothers; Mrs. Fred Mickelson and Henry of Sleepy Eye; Mrs. Barbara Juenemann and John of Springfield; Mrs. William Guggisberg, Gibbon and Mrs. John Juenemann, Clements. Monsignor Frank Galles presided at the Mass of Christian Burial in the Chapel of Our Lady of Lourdes, Assisi Heights, at 2 pm Monday. Burial was in Calvary Cemetery. Barbara Marie Hillesheim, B: 08 Dec 1890, D: 29 Mar 1983 in Brown, Minnesota. Bernard Hubert Hillesheim, B: 07 May 1883 in Minnesota, D: 11 Jun 1959 in Minnesota. Peter Alexander Hillesheim, B: 15 Dec 1877 in Sleepy Eye, Brown, Minnesota, D: 27 Sep 1957 in Sleepy Eye, Brown, Minnesota. Henry Aloysius Hillesheim, B: 19 Feb 1896 in Brown, Minnesota, D: 25 Jan 1980 in Minnesota. Joseph Anton Hillesheim, B: 28 Nov 1873 in Minnesota, D: 08 Jan 1944 in Minnesota. Florian Christopher Hillesheim, B: 27 Jul 1892, D: 30 Jan 1969. John Henry Hillesheim, B: 09 Aug 1884 in Brown, Minnesota, D: 17 Aug 1975 in Minnesota. Heinrich Bernard Hillesheim-6(Arnold-5, Joannes Carl-4, Peter-3, Carl-2, Peter-1) was born on 24 Oct 1833 in Germany. He died on 22 May 1923 in Minnesota. He married Anna Maria Keber.She was born in 1837. She died in 1923. Arnold Hillesheim, B: 23 Jul 1865 in Minnesota, D: 24 Dec 1900 in Minnesota. Anna Hillesheim, B: 1869, D: 1913. Mary Hillesheim, B: 1871, D: 1939. Henry Hillesheim, B: 1873, D: 1953. Frank Anton Hillesheim-7(Hubert G.-6, Arnold-5, Joannes Carl-4, Peter-3, Carl-2, Peter-1) was born on 01 May 1899 in Minnesota. He died on 21 Sep 1973 in Brown County, Minnesota. He married Catherine Goblirsch, daughter of Joseph Goblirsch and Mary Mathiowetz. She was born on 25 Oct 1893 in Sleepy Eye, Brown, Minnesota. She died on 14 Dec 1942 in New Ulm, Minnesota. Mrs Frank Hillesheim died suddenly Monday at Loretto Hospital in New Ulm following an operation. Fineral services were held at St Mary`s Catholic Church in Sleepy Eye with interment in the church cemetery. Catherine was born Oct 25 1883, in Albin Township to Mr and Mrs Joe Goblirsch. She was united in marriage with Frank Hillesheim at St Mary`s Church, Oct. 24, 1914, Rev Klein performing the ceremony. Twelve children were born to this union, two of them dying in infancy. Leslie Albert Hillesheim, B: 10 May 1927 in Stark Township, Brown, Minnesota, D: 05 Mar 1994 in Cambridge, Minnesota. Albert Joseph Hillesheim, B: 29 May 1924, D: 02 Jan 1995 in Brown, Minnesota. Margaret Hillesheim, B: 30 Mar 1930 in Stark Township, Brown, Minnesota, D: 02 Apr 1930 in Stark Township, Brown, Minnesota. Walter Clement Hillesheim, B: 23 Nov 1916, D: 06 May 2000. Roman Gregory Hillesheim, B: 12 Mar 1922 in Minnesota, M: Angela Mary Huiras, 12 Oct 1943. Lawrence Peter Hillesheim, B: 19 Jan 1932 in Sleepy Eye, Brown, Minnesota, D: 31 Jan 1969 in Hartley, Iowa. Linus Francis Hillesheim, B: 29 Oct 1925 in Sleepy Eye, Brown, Minnesota, D: 31 May 2006 in Sleepy Eye, Brown, Minnesota. Veronica Hillesheim, B: 12 Aug 1917, D: 16 Aug 1964 in Brown, Minnesota. Elizabeth Hillesheim, B: 19 Nov 1915 in Stark Township, Brown, Minnesota, D: 23 Nov 1915 in Stark Township, Brown, Minnesota. Christopher Arnold Hillesheim-7(Hubert G.-6, Arnold-5, Joannes Carl-4, Peter-3, Carl-2, Peter-1) was born on 02 Nov 1876. He died on 20 Dec 1966. He married Amelia Evan. Joseph Anton Hillesheim-7(Hubert G.-6, Arnold-5, Joannes Carl-4, Peter-3, Carl-2, Peter-1) was born on 28 Nov 1873 in Minnesota. He died on 08 Jan 1944 in Minnesota. He married Margaret Mertz.She was born in 1875. She died on 14 Dec 1942. Catherine Anne Hillesheim, B: 03 Aug 1903 in Brown, Minnesota, D: 12 Jun 1992 in Sleepy Eye, Brown, Minnesota. Hubert Hillesheim, B: 15 Jan 1902 in Sleepy Eye, Brown, Minnesota, D: 21 Aug 1993 in Sleepy Eye, Brown, Minnesota. Arnold Hillesheim-7(Heinrich Bernard-6, Arnold-5, Joannes Carl-4, Peter-3, Carl-2, Peter-1) was born on 23 Jul 1865 in Minnesota. He died on 24 Dec 1900 in Minnesota. He married Frances Elizabeth Roll, daughter of Michael Roll and Hedwig Zimmerman. She was born on 02 Apr 1866 in New York. She died on 18 Feb 1940 in Minnesota. Maria Anna Hillesheim, B: 1893, D: 1935. These dates and location are for her husband Nic Gulden.